Rick and Morty: Season Two - Blu-ray Review - ReDVDit! 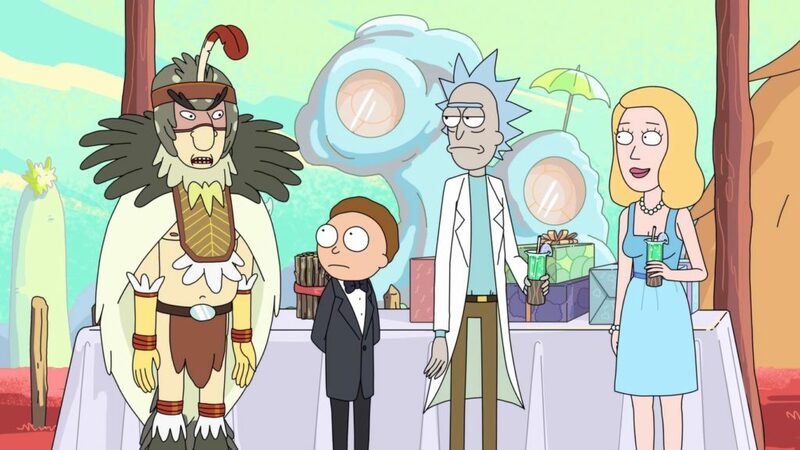 At first glance, Rick and Morty doesn’t look like the next logical step for former Community showrunner Dan Harmon, but the animated collaboration between Harmon and creator (and primary voice actor) Justin Roiland delivered on the snappy dialogue, complex yet silly plot lines, and on point culturally relevant references that fans of Harmon’s work had come to expect. Further, it delivered to Adult Swim the hit they needed in the wake of Aqua Teen Hunger Force‘s tenure coming to a close on the network. 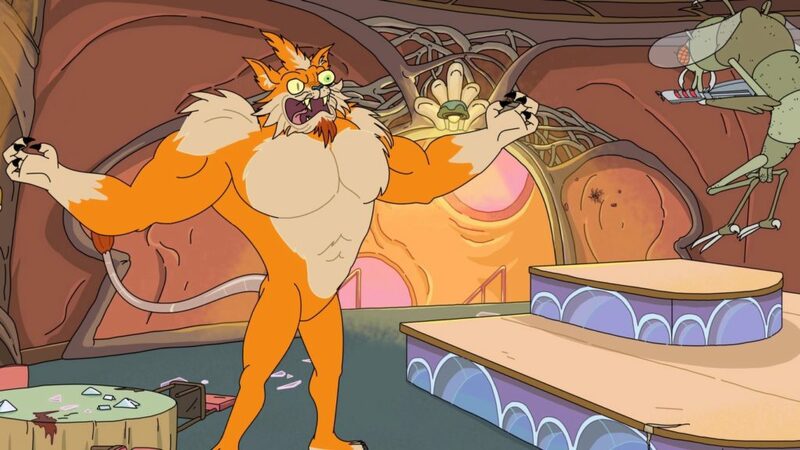 Most folks who tuned into episodes from the first season of Rick and Morty had a hunch that they were seeing something special on television: an animated show that truly felt both ahead of its time and yet totally apropos. 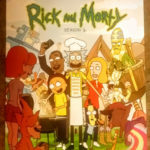 When season two was announced, fans hoped that the show would continue to deliver on the extreme material that marked it as different and unique from most other animated fare on cable, and the team of Harmon and Roiland did not disappoint. I watched the entirety of both seasons as they aired, even coming back to re-watch them from time to time on my DVR. Now, I have the pleasure of revisiting Rick and Morty in high definition. 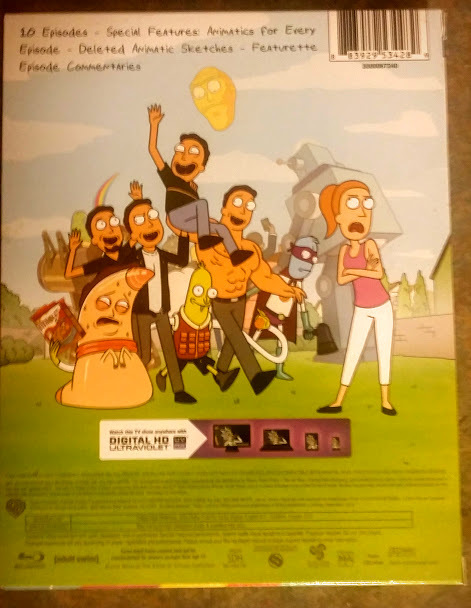 Coming to consumers in a standard Blu-ray case with side-open slipcover and additional “Plumbus User’s Manual”, Rick and Morty: Season Two arrives on a single BD-disc (decorated like a Plumbus). Let’s take a look. 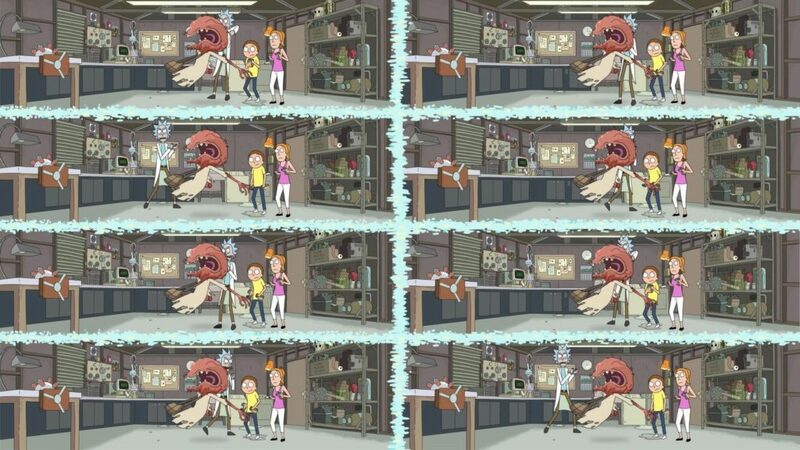 Like season one, Rick and Morty season two features ten episodes at roughly 22 minutes per episode, the cable standard. This season, even more than the first featured an absolutely overwhelming number of guest voices, speaking to the success and broad reach of the show, including Christina Hendricks, Tricia Helfer, Keegan-Michael Key, Jordan Peele, Patton Oswalt, Jim Rash, Alan Tudyk, and legendary director Werner Herzog. The star, however, is still Roiland, voicing both inebriated genius Rick Sanchez and timid sidekick Morty Smith. One has to wonder, at times, how Roiland manages to juggle all of his responsibilities in running the show, but the frantic nature of both Rick and Morty as characters could likely owe some of their personality to Roiland’s schedule. This season began to flirt, at times, with an overarching plot to the world that the characters in the show occupy. Recurring characters and callback jokes begin to fill out a world that, during its first season, seemed to revel in the “reset” nature of weekly episodes. This all comes to a head in the final episode of the season where all of Rick’s years of hard drinking and bad decisions catch up with him. In between the standard fare of sharp humor we’re given scenes of real poignancy. 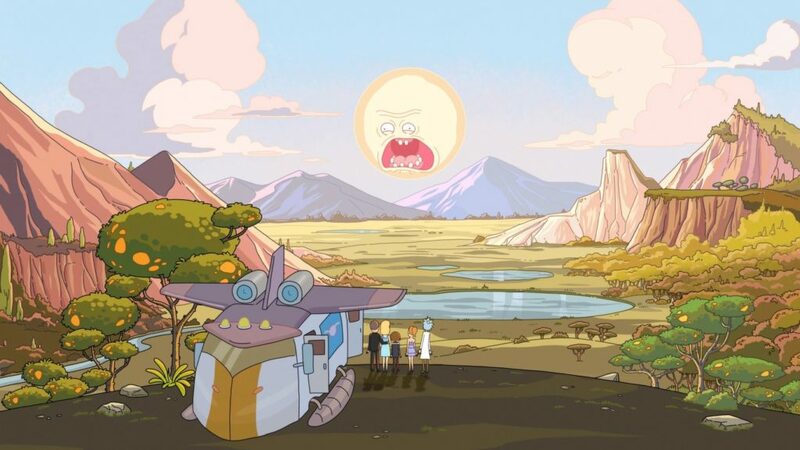 With that in mind, one has to wonder what the future of Rick and Morty will look like. 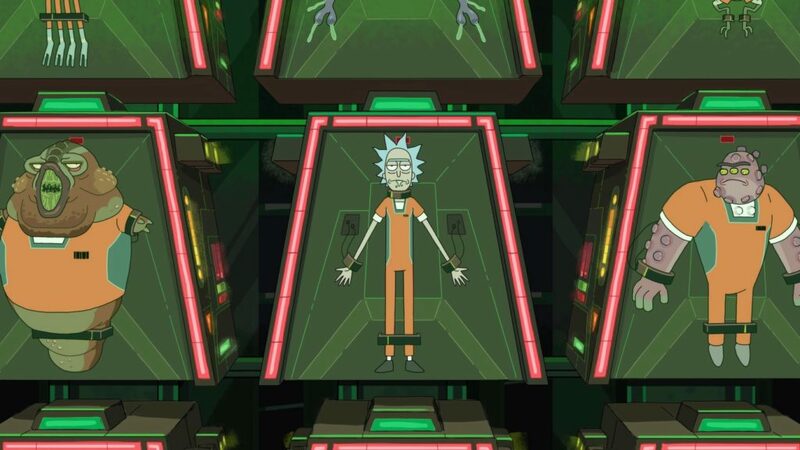 The places where Rick and Morty stumbles are few and far in between, but I have to dock the season slightly for its first episode, “A Rickle in Time”. It’s an episode that has plenty of laughs, but its concept doesn’t deliver in the way that I think the showrunners hoped it would. With so much to focus on, some of the humor gets lost in the presentation. That being said, Rick and Morty is easily one of the best and funniest shows on television with a stunning amount of consistency. Shocking I know, but contemporary animation features rarely do anything but impress on high definition home formats. Rick and Morty is a dynamic show in virtually every metric, but of particular note when it comes to visual presentation is the show’s dedication to a rich and diverse color palette. With that as my focal point, I’m pleased to report that this disc does not disappoint. The show’s animation is relatively smooth and there’s no failure on behalf of the disc’s presentation. The bonus animatics are also totally crisp and clear despite the rough edges of the animatics themselves. The picture is flawless from first episode to the last. Rick and Morty: Season Two arrives with an acceptable Dolby 5.1 mix. Conversations are sharp and characters are easily distinguished, but there’s nothing here to make it particularly noteworthy. Background noise is not a common feature in the show, so when it appears it can feel jarring, but the mix doesn’t overwhelm the dialogue. That’s not to say that the mix isn’t up to the job, but this isn’t what you put on when it’s time to demo your system. I am disappointed. 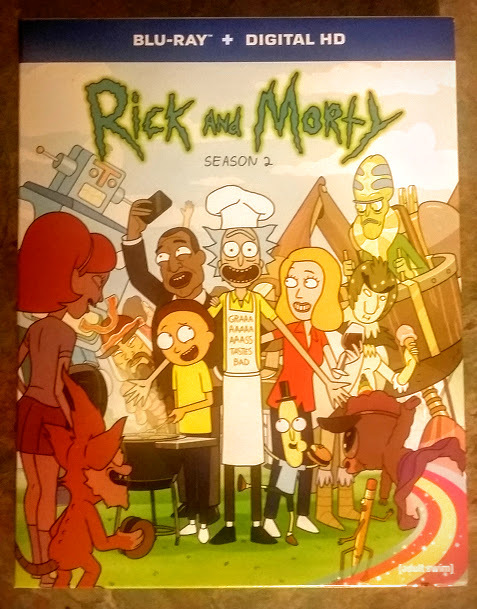 Largely similar to the first season’s release (except for the spine designs which do NOT match up), the special features and packaging for Rick and Morty: Season Two are sadly uninspired fare. Each episode features commentary from the folks involved in the production, varying from episode to episode. Further, special guests chime in for their own commentary tracks on three of the ten episodes, including WWE Superstar Sheamus. In addition, we’re given looks at the animatics produced for each episode. These animatics are the “moving storyboards” animators use as a proof of concept before sending off their work to the animation department. In addition, they included a small handful of “deleted scenes” animatics, jokes and set-ups that didn’t make the final episode cut. By and large, it’s a throwaway special feature series without much to add to your experience. Finally, an Ultraviolet digital code is included for folks who like to watch on the go. As I hinted at above, the packaging is standard fare for television series. For a show with such a knack for standing out, the packaging does anything but. The only fun addition is a multiple page booklet for operating a “Plumbus”, a gag from the “Interdimensional Cable” episode from the second season. 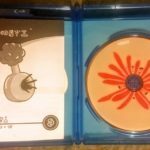 Fans of the series will enjoy a quick thumb through and notice the disc itself is made to look like a Plumbus. 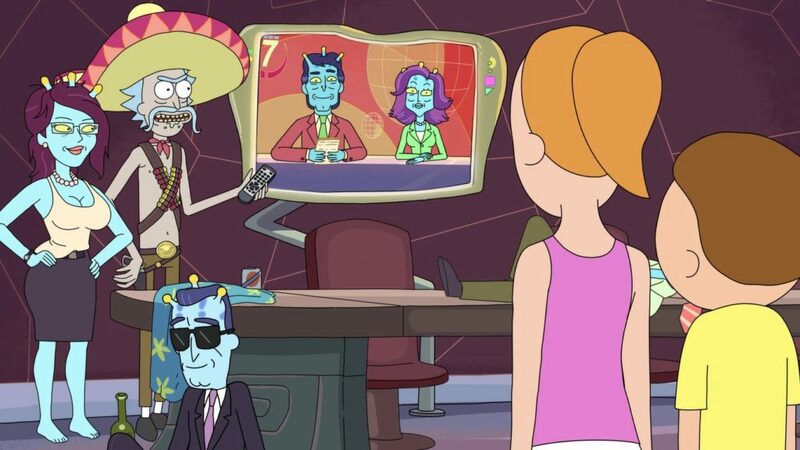 Fans of Rick and Morty are not going to be deterred if they can’t wait for one of television’s funniest shows to make it onto their preferred streaming service, but while the audio and visual presentation is excellent, the overall delivery of Rick and Morty: Season Two is bound to leave most disappointed. The included special features are, by and large, very by the numbers and somewhat lackluster. The animatics are interesting for those who want a behind the scenes look at how these cartoons go from concept to screen, but any real discussion or content that would illuminate the process of how a show as off the wall as Rick and Morty gets made would be the kind of addition that would get fans like myself really excited to add this to a home library. It pains me to not give one my favorite shows a stronger rating, but the lack of strong bonus features is a detriment to this release. Joshua Jenkins is a high school English and Film teacher, specializing in introducing teenagers to the wide and diverse world of films and film making. He has been collecting films for over a decade and is a featured actor in a Troma film. He'll never, ever tell you which one.